RUSH: It’s great to have you here, my friends. 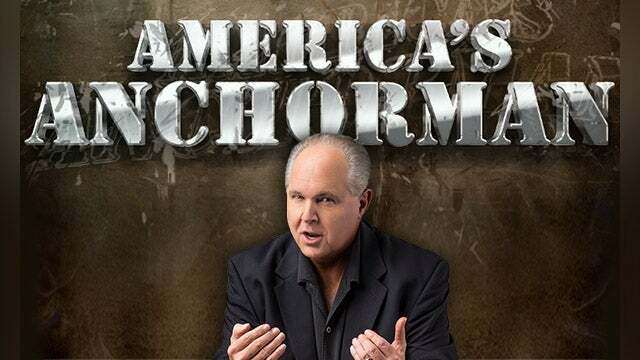 I am Rush Limbaugh, and I’ve been doing this a long time. I am America’s Real Anchorman. You know, if anybody asks you, where can you go for straight news, tell ’em here. We do both. We give you the straight news, as we know it, and then we opine on it and tell you what to think about it. And we tell you what is on the left side of the news as well. Part of the gig here is helping people understand the poisons and the absolute destructive nature of liberalism. And in order to instruct and teach people, you gotta know it. And I know liberalism. I know them. I know them to a T. And so when you tune to this program, not only do you get the news that’s happening out there, you also get my unique, irreplaceable thoughts on that news and then analysis and opinion. You can’t go wrong. You know, people ask me — they do frequently, even now, and it’s always, how do I prep, how do I get ready for this, “How do you know so much?” It’s just a lifetime spent learning, is the answer. And I’ve been blessed with a good memory, so I have a decent foundation of knowledge of events of history combined with my opinion, which I don’t have to remember because it’s in my heart. So it just every day builds on the knowledge base that I have accrued over the course of my lifetime. And part of that has been to understand factually, psychologically, which is a big factor, emotionally as much as I can about liberalism so as to be more effective in destroying it and informing people of its inherent destructive nature. But people say, “Where do you go to learn?” It’s a fascinating question, because there isn’t anywhere. There isn’t one place that you can go that you can trust. You’re just learning what happened at a place where you weren’t, which is what journalism purports to be. Telling you what happened in places you weren’t, so therefore you don’t know. That’s a far cry from what it has become. But it’s the irreplaceable experience of having done this for so many years with the knowledge base buildup doing so. There’s no way you can cram — for example, if I don’t know what I knew, I couldn’t cram for it in a week or two and then be prepared to do this program. It’s a product of a lifetime of devotion, of work, what have you. That’s why you can trust it. This is the place. If you want to find out as close to real what’s going on and then the alternative opinion of it and then the right way to think about it, this is the place.